Posted on Sat, Jan 21, 2012 : 12:01 p.m.
Update: The freeway has been reopened as of 12:55 p.m.
A crash forced the closure of eastbound Interstate 94 east of Zeeb Road in Scio Township about noon today, a dispatcher with the Washtenaw County sheriff's department said. No information about what kind of vehicles or how many were involved in the crash west of Ann Arbor was immediately available. Interstate 94 between Ann Arbor and Ypsilanti has had multiple crashes this morning following a snowfall of about 2 inches Friday night. 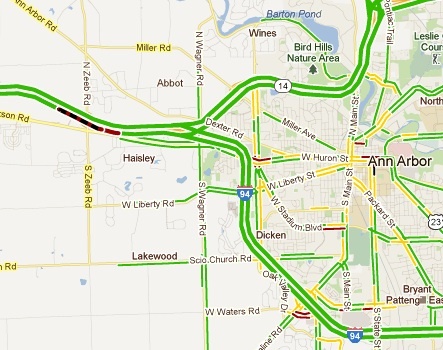 The area of Interstate 94 affected by the crash can be seen in red and black on this Google map.